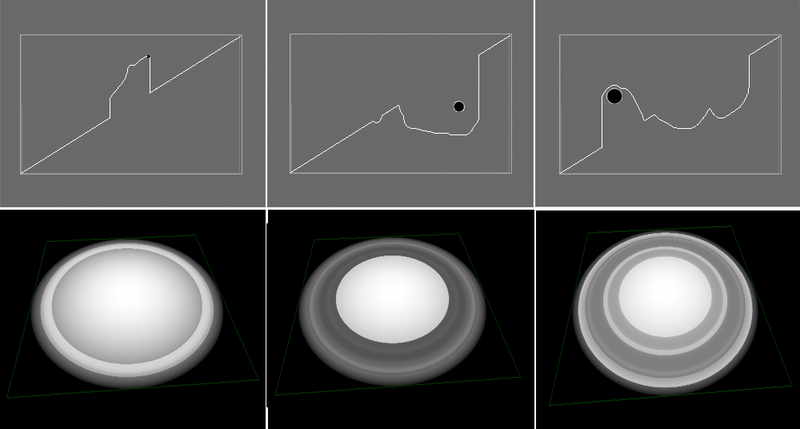 This node modifies the mask profile by changing the values of the vertices on a curve that define the mask values. 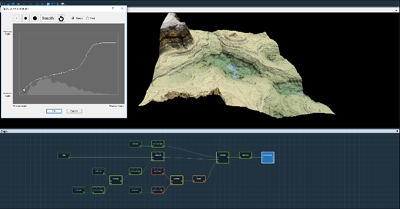 To add an Apply curve node, right click in the Graph Editor and select Create Node > Mask Transformation > Apply curve. To change the mask size, edit the Width and Value fields in number of vertices. To change the quad size, edit the Quad size field in meters. The minimum and maximum value of the vertices are represented by a value of 0 and 1, respectively, on the curve. Minimum value: Determines the minimum value of the vertices whose value on the curve is 0. 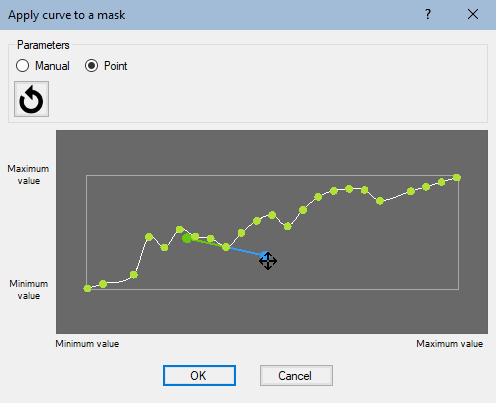 Maximum value: Determines the maximum value of the vertices whose value on the curve is 1. By default, the Manual curve editing mode is activated. Select your cursor size from small, medium, and large. Using the smallest cursor makes detailed changes to the values; using a larger cursor makes changes to larger areas in the mask. Click and drag the mouse to change the mask values. 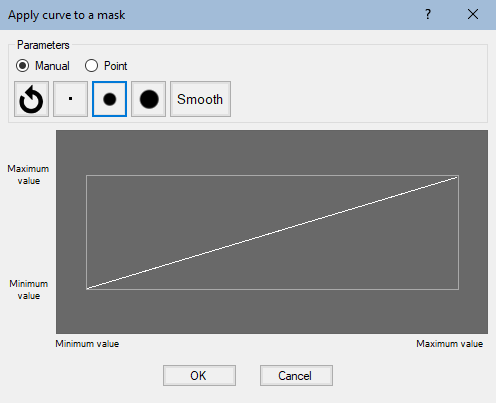 Click on the Smooth button to smooth the values of a curve. You can click several times to smooth more. Once you have edited your curve, you can switch from the Manual mode to the Point mode to add control points. The control points are displayed in increasing subdivisions of five, from 5 to 50 points. A higher number of control points gives you more control over the changes you make to the curve. Click on the Point button in the Parameters dialog. Select the maximum number of subdivisions from the drop-down list. Edit the control points by clicking on a point and dragging the mouse to a new position. Smooth point: Drag the anchor points to smooth the point. The anchor points are paired, resulting in a smooth curve. Angle point: Drag the anchor points to smooth the curve. The anchor points are unpaired. 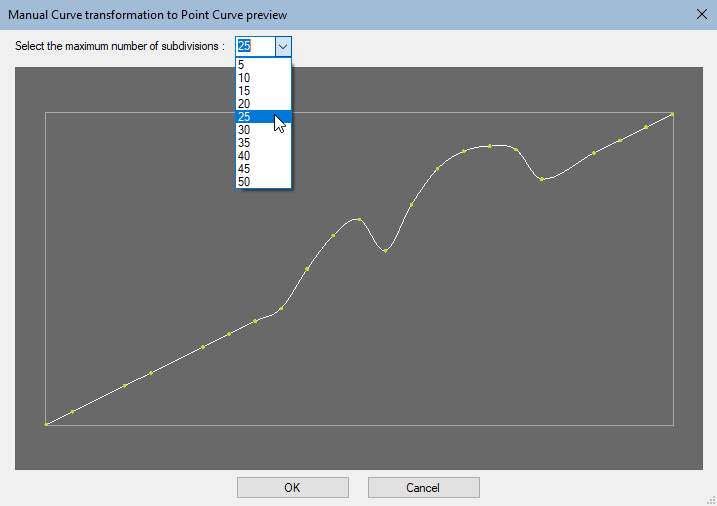 If you have not yet edited your curve in the Manual mode, you can click on the curve in the Point mode to add and edit points. To delete a control point, right-click on it and select Delete this control point in the contextual menu. Click on the Reset button to reset the curve to the default values. Watch our Apply curve node video tutorial. Selection of the size of the cursor used to distort the curve.